Cream puffs, eclairs, profitore rolls - even a croquembouche - all start from the same basic dough. And while it's fairly simple, it's really nothing like most cake or cookie doughs at all. It starts in a pot, then moves to a mixer, then a piping bag, then the oven. There's a fair amount of work involved, but the end result: Delicious. You can make cream puffs, which are round, or eclairs, which are long and thin, or even... swans. 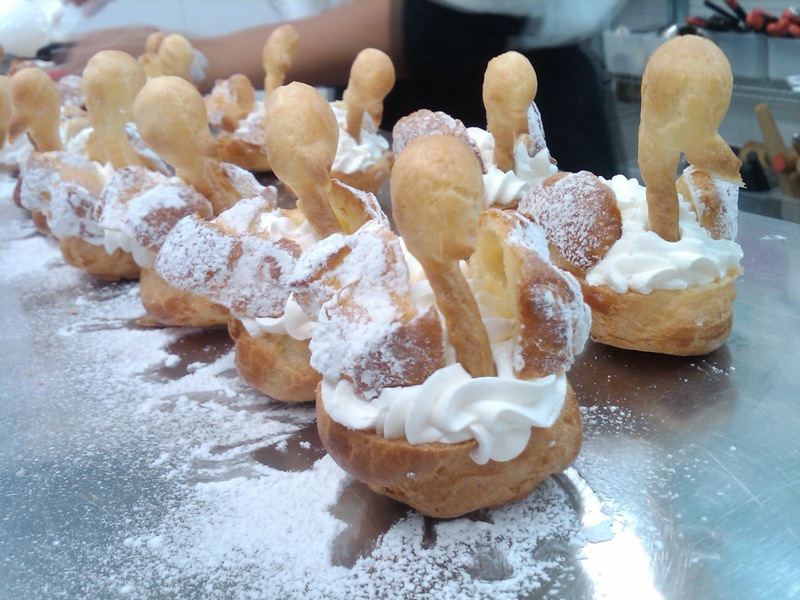 Yes, cream puff swans. They're after you! It's all the same basic dough, so you can bake one batch and create all three! These were filled with creme legere, which is a pastry cream that is then lightened with fresh whipped cream. You can go that route, or you can even just fill them with plain 'ole whipped cream, and they'll still be seriously tasty, in a lot less time. Some are topped with chocolate, and others with poured fondant, which is an ingredient you can find in most baking supply stores, or made with a recipe like this. Then decorated with a little melted chocolate. There are members of two camps when it comes to eclairs: those who say you should fill them, then cover the tops, and those who say cover, then fill. I vote for the former, otherwise you will risk rubbing all the topping off on your hands as you fill them. Tip of the Day: Fill the eclairs slowly, feeling with your hand as they get heavier, then stop just when you start to feel resistance - you don't want to overfill. Bring the milk, water, salt and butter to a rolling boil in a medium-large pot. Add the flour to the pot, and stir well with a wooden spoon, mixing continuously until it forms a ball and a film appears on the bottom of the pot - about 2 minutes. Remove the mixture from the pot and mix with a mixer or by hand in a bowl for 2-3 minutes, until it begins to cool down. Add the eggs, one at a time, mixing between each addition. After you've added the first 450g, pinch a piece of the dough in your hand, then pull your fingers apart, the peak of the dough should just curve over a little. If it is too stiff, add a little bit more egg, and mix then test again. When the dough is ready, fill a pastry bag fitted with a medium sized tip - #s 8 to 10 would work well. Pipe round circles for cream puffs or about 2 inch logs for eclairs, on to a parchment paper-lined baking sheet. Mix together the egg and milk or cream then brush a thin layer on to the cream puffs or eclairs, making sure none puddles on the baking sheet. Bake on 400 F for 15 minutes then lower the oven to 350 F and bake another 10-15 minutes, until light golden brown and puffed up. DO NOT OPEN THE OVEN DOOR UNTIL YOU'RE READY TO REMOVE THEM. Let the puffs cool on the sheets completely. 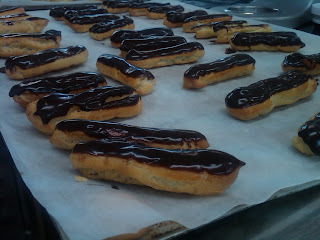 Using a sharp knife, poke a whole in the bottom of each cream puff or two holes in the bottom of each eclair. Put your cream in a piping bag fitting with a small tip, and pipe in to each cream puff or eclair until filled. Dip the tops of them in melted chocolate, and enjoy! Mix together the milk, half the sugar and the vanilla in a medium pot and bring to a boil over medium heat. Meanwhile, whisk together the remaining sugar, eggs and cornstarch until smooth - make sure no lumps remain. When the milk comes to a boil, pour half of it slowly over the eggs mixture, whisking constantly, then return everything to the pot and bring back to a boil, whisking constantly. When it comes to a boil, remove from the heat and immediately pour in to a clean bowl (have on hand before you begin). Whisk in the strawberry puree until evenly distributed. Cover with plastic and refrigerate the pastry cream until chilled through - several hours. Whip the whipping cream until it holds soft peaks. Remove the pastry cream from the fridge, whisk well to break up any lumps, and fold in the whipped cream. I'll take some of these next week.